I started teaching at Classical Cottage School last week. It has been 8 years since I set foot in a class room. My studio class is my favorite. The students are there to have fun and learn. Our first project will be a comic book cover painting. Hands and faces terrify most artists. To this day I hide hands, or simply lose my mojo when I get to that part in a portrait. I didn’t waste time with this project. The kids were drawing their hands the first day. The steps were straight forward: 1) draw your hand, 2) draw a hand from the hand out, 3) draw a hand from the hand out using a graph, and finally, 4) draw your hand again. There were some surprising results. Many of the students (in a mixed class of boys and girls aged 11-15) drew their first hand from a frontal position with all fingers fully extended. When I first taught high school in 1998, most of my students were boys between the age of 14 and 16. One of their favorite tricks was to trace their hand (fully extended on the paper) while I wasn’t looking and claim that it was drawn from observation (cheeky devils). But this group from CCS was a little different. The majority of them took my plain instructions to heart, and simply looked at their extended hands. All artists develop proclivities to compensate for their natural abilities. I never draw a frontal hand fully extended if I can avoid it. It’s like drawing a face straight on without any contrast in light– challenging and boring all at once. It is a great painter or draughtswoman who can pull it off. Turn the hand or face or light source to the side and then you have something you can really sink your pencil and eyes into. When the students got to the graph, many were perplexed. They could not see the purpose of graphing. Many sit on the fence with regard to graphing in REAL ART. I confess that it was not something I used until I became a teacher. 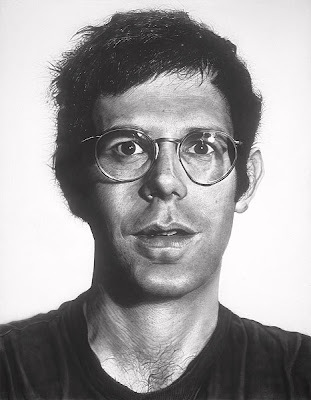 Chuck Close used it masterfully to create his Superrealistic Portraits for the eponymous art movement of the 1970’s. It’s a technique that works– for the right kind of brain. Very few of my students found the graph to be useful. A third of them did use it to great effect, however, and as the exercise went on, their hands got better from what they learned from the graph. Most did really well when they copied the handout hand without a graph. When they completed the 3rd hand I consulted with each of them to talk about what strategy worked best for them. My advice to most of them was to turn their thumb toward them so that their middle, ring and pinky fingers were in the background of the C formed by their index and thumb. My hope was that they would be creating their own GRAPH by drawing the three somewhat hidden fingers in relation to the relatively easy shape of the index and thumb. For half of the kids it worked well. I foolishly let them take all their work home so that I don’t have pictures to share here. Their assignment was to draw three more hands at home. I am eager to see how they do. Linus at 3 months, acrylic on canvas. As an artist I find it very difficult to stop and take the advice I dispense to students. I rush through work slapping paint onto the surface as I listen to music and want it be done. At least I have progressed from a time where I would not even get started because I was overwhelmed by details. My most recent portrait of Linus has been an eye opener. My son’s face is too close to my heart to paint easily. In fact, I have painted him face on only twice because it is so hard. His portrait at three months was one of the projects that brought me out of post-partum and back to my art. I repainted his eyes 5 TIMES! and I still did not get it right. I did not use a graph. 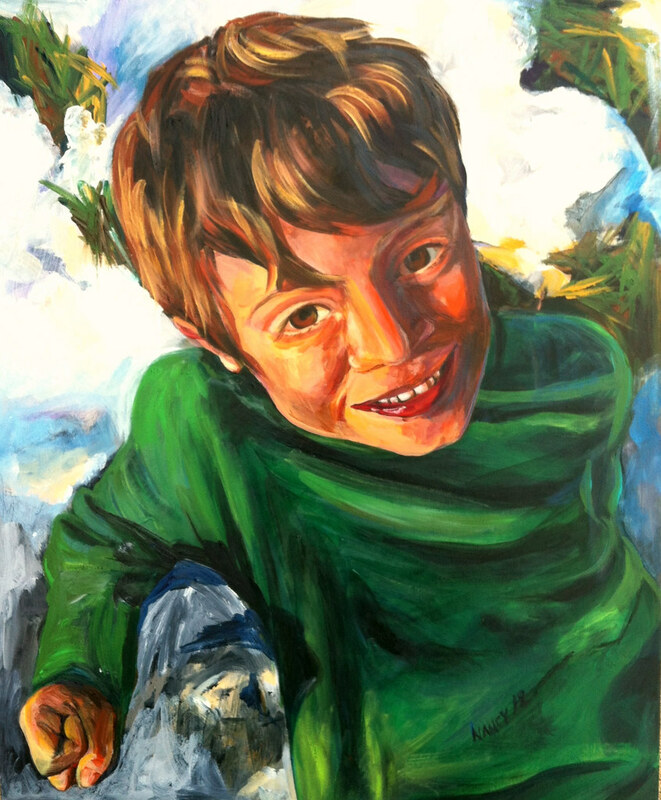 His most recent portrait was done from a photo in the October snow of 2011. A beautiful day for pictures at dusk, for the enhanced brightness the white brought to the green grass that peeked from below the premature mantle. I took a series of shots as he giggled in the oblique, intense light. I often ask myself the question that artists like Chuck Close answered in their art– why paint when you have such a pretty photo. I am not Chuck Close, so it is even harder to overcome the obstacle of the photo. Nonetheless I continue to take it on with portraits– to what end, I am still not sure. It took a long time to get to this painting. I liked the yoda painting too much to move on, and a son’s face is often too bright to see, much less paint properly. I wasn’t going to make the same mistake of not using the graph. His eyes are too prominent for my hesitating hand to capture without guidance. Linus in Primatura, summer 2012. The first step was a contour drawing on a graph. The next was to slap some paint on hurriedly to get over my shock of orange against green and blue (a color combination I avoid at all costs). The effect was so intense that I left the painting untouched for over 2 months. It was only fair to come back to it this week before asking my class to embark on self-portraits. What I couldn’t or did not want to see was that I had given my seven-year-old an adult nose with the heavy contrasts of October light. I do what I usually do in a painting when I can’t figure things out, I focus on the shirt. I got those folds perfect before I even touched his nose. The hand at the bottom left was a whole other story. At the end of 5 hours of painting yesterday I thought I was done. I signed it (as always, premature) and even put it in a frame. And then I saw the nose. I had put his grandfather Aldo’s nose on his face AHHHH! Where were the freckles too? I worried about it all night and immediately ran to fix it this morning. Here are the two completed? versions side by side to see if there is any improvement. In October Snow (almost finished), the cheeks don’t compete enough with the nose that has at least 4 different values on it alone that make it look like an adult nose. And where were the freckles. The hand had yet to be completely defined as well. My insatiable internal critic still wants to go back and fuss with his right eye. The upper lid still isn’t molded as well in the shadows. I have taken on teaching, faces and hands in one week. I am pooped! Hope I have enough energy to tackle my slide presentation for art history.